It's like stepping back in time to a long forgotten age. The 1930's perhaps? Like something out of an Agatha Christie novel. "I'm putting the collars up on my long trench coat, pulling my hat firmly down on my head to protect me from the billowing wind that howls around the platform. Everyone waiting for the train is eyeing each other up, suspicion like smoke in the air." We're taking the train to Corfe by steam. Just need the outfit now to fit in! Our journey is to take us to visit to the famous Corfe Castle. I can categorically say here and now that if you visit this part of the world then this is the trip to go on. With authentic ticket in hand we steamed our way on the 1040 train through the valley towards Corfe. Campsites and rolling hills and farmland dominate as you gently meander your way towards the castle. As do a couple of little stations on-route. It's a pleasant trip and there's something about going on a steam train that just seems to make the journey more fun. Sound of the puff puffing, the clickety clack of the carriage wheels on the rail? After around 20 minutes you're coming into the station at Corfe, the castle clearly visible as you step off the train. Once in the quaint town, which has sweet shops, tea rooms galore, as well as a model village, you can't miss the castle. It's on top of a hill! It's a fantastic place to visit but a word of warning, it's a National Trust place (no bad thing mind) so you'll either have to pay (£9 for an adult, £4.50 for a child) or just don't forget your card if a member. Thankfully I didn't. Once inside you're free to explore at your own pace, well the kids pace anyway. There are plenty of information boards and activities for the kids. There was a kids trail and on the flatter ground re-enactments from times long past. As you climb the hill you get spectacular views across to the Purbeck Hills and down on the village. Boy it's steep in places. This is certainly the perfect spot to have a castle, that's for sure and you can happily while away a couple of hours. Add in all this is a terrific excursion. 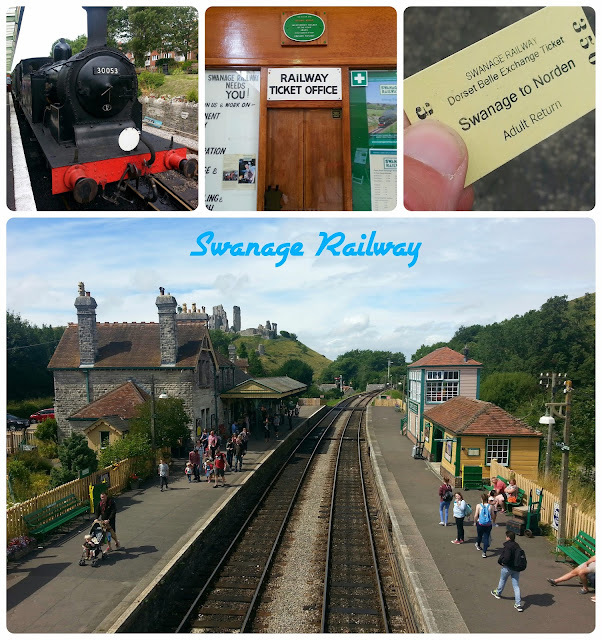 Corfe Castle is a fantastic attraction and the journey on the Swanage Railway is pure nostalgia. A visit to a cafe or the sweet shop in town and it's a great day out from Swanage, Poole or anywhere in that part of England. We even managed to get back to Swanage and then go for a swim in the sea! Have you been? 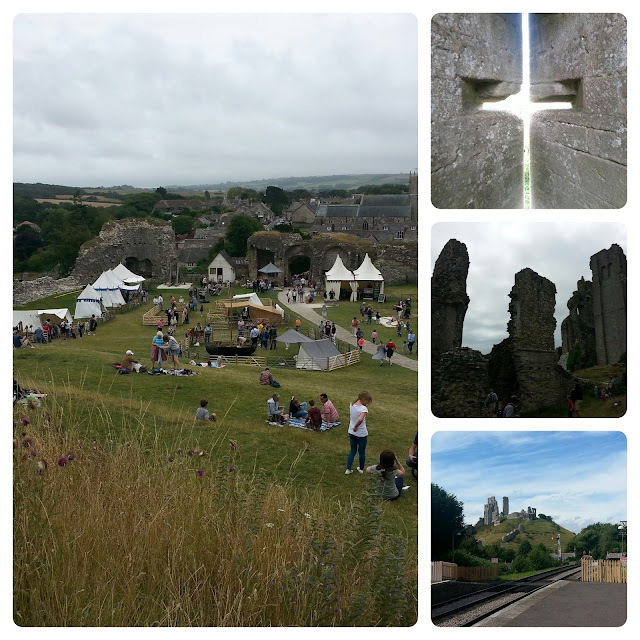 What memories do you have of Corfe Castle? I'll look forward to your thoughts.